Sprawl & Crawl: Are work commutes actually worse than you think? It turns out politics isn’t the only kind of gridlock in Washington, DC. It also has more traffic gridlock than anywhere else in the country. This past weekend, The Wall Street Journal published a feature story in its “Personal Journal” section that profiled how businesspeople cope with their daily work commutes. It turns out that the average daily work commute in the United States takes about 25 minutes. Another interesting statistic from the article is the amount of time car commuters in larger cities spend stuck in traffic: 52 hours annually, or about an extra hour per week. The WSJ story profiled several people who access mass transportation for their work commutes, as well as one businessman who relocated from the Washington, DC Metropolitan area to Metro Cincinnati, substantially reducing his daily commute time and hassle in the process. As someone who lives not far from the DC Metro area and who contemplates any drive through the region with a mixture of disdain and dread, this got me to wondering: Just what is the worst geographic market for commuting? Helpfully, there’s a recently completed study that answers this very question. The Transportation Institute at Texas A&M University has applied a calculation tool called the Planning Time Index (PTI) to compare drive times in heavy traffic (i.e., rush hour) against travel times when the same highways are clear. The way the PTI calculation works is this: A PTI of 2.00 means that a “normal” drive will take twice as long in heavy traffic. Using that PTI=2.00 example, a drive that may ordinarily take ~20 minutes will take ~40 minutes instead. How do these PTI indices translate into actual drive times? 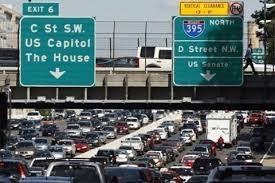 Shockingly, a DC-area commute that ordinarily takes 20 minutes translates into almost two hours in heavy traffic. And among all of the other “top ten” worst markets, that normally 20-minute commute will take 1.2 hours or longer in rush-hour traffic. Interestingly, when one scans the “Top Ten” list, the only Midwest urban area that shows up on it is Chicagoland. So if you wish to avoid the hassle of long commutes, consider relocating to urban markets in the Midwest like St. Louis, Minneapolis-St. Paul, Cleveland, Milwaukee or Kansas City. But what’s the absolutely easiest metro market for commuting? According to the Texas A&M study, it would be Pensacola in Florida. It has a PTI of just 1.31. … Which means only about six extra minutes in rush traffic compared to the ordinary 20-minute commute. Come to think of it … Pensacola has great beaches and nice sea breezes as well. Perhaps dealing with the occasional hurricane is worth it, all hassles considered!